So this is what my #SriniOnTour looks like as of now… It’s certainly a different kind of vacation that I have ever taken. Yes, I have certainly blogged about most of my long weekend, on the spur of the moment type of trips. Certainly have always wanted opportunities like these to glorify my travelogue and make sure that I let loose the wild traveller within me. 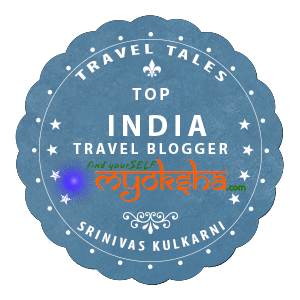 This journey however has much more significance than just one of those blogs or travelogues. With every blog that I post, I hope to tell a story that will build and develop itself. A story that will mean a lot more than what it seems. A story that we all hope for and expect to really make some sort of a difference to our lives. You may want to stay tuned to these links below as well Hope you find this interesting too. This entry was posted in South and tagged Aurobindo Ashram, Auroville, God's Own Country, India, India Tour, Kerala, Kerala Tourism, Kumarakom, Munnar, Munnar Tea Plantation, Pondicherry, Slideshare, South India, SriniOnTour, Tamil Nadu Tourism, Tourism, Travel on December 21, 2010 by srinistuff.